Sooner or later, small businesses face the task of powering an e-store. You’d better hop on as soon as possible to keep growing and start selling in spades. Fortunately, the modern web offers you comprehensive website creation tools that are manageable even if you’re a newbie to electronic commerce. Among such tools, ready-made modern Shopify themes are the ones that really hit home. They bring you professional designs and generous sets of valuable e-store functionality. Today, we want to introduce you to 15+ best Shopify templates that nail it down both from UI and UX perspectives. Why It’s Wise To Go For Shopify? Shopify is an e-store engine worth speaking a couple of words about. Thanks to its simplicity and intuitiveness, many store owners love it. Even a novice to e-store management could maintain the work of a Shopify store. Moreover, with Shopify, you don’t need to bother about searching for a decent hosting and installing/updating the engine. Shopify team takes care of all of this for you. So, despite Shopify is not a free engine, the customer service it comes with is a true time and money saver. First of all, Shopify brings you comprehensive store management with a clear and well-structured dashboard. Secondly, the engine comes with the place for your store on Shopify servers. For the money you pay, Shopify team provides you with a top-notch hosting that’s ultimately secure and ensures the good performance of your website. Thirdly, whenever you feel lost in Shopify, you can reach out for 24/7 web chat, phone or email support. Moreover, Shopify harbors a rich extension store, the items of which can extend the functionality of your store the way you need. Recently, Shopify enjoys a popularity surge thanks to its forward-looking social commerce options and mobile-first emphasis. Not surprisingly, Shopify template market evolves accordingly. Quality 2018 Shopify themes have trend-setting designs, highly engaging UIs and functionality that dazzles. 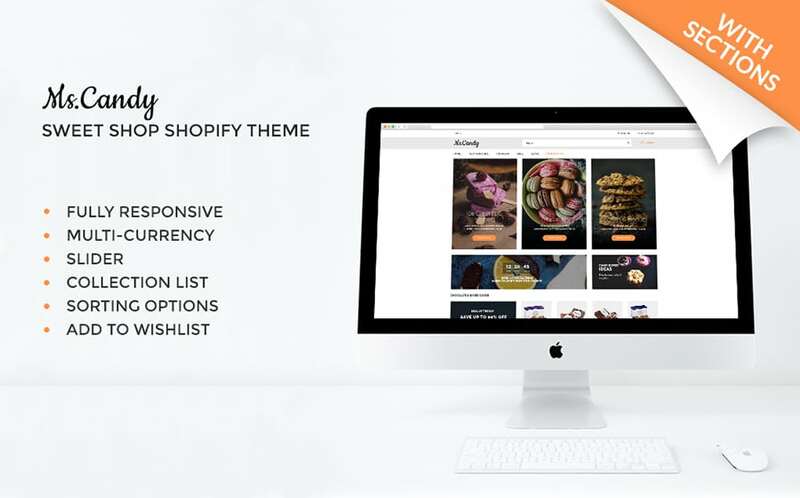 In this post, we feature 15+ Shopify premium themes, so that you can eye-witness and get hold of the greatness they deliver! Ezone template has all you need to turn your store into a smashing hit within month or even weeks after launch. It comprises 11 polished skins for different industries, perspectives and needs. With Ezone, building a profit oriented e-store is as simple as ABC. You don’t have to wrap your head around powering such much-needed features as smart product filtering, collections, social sharing and more. They’re already in, along with the plethora of the hottest layouts and sections that come pre-packed for your convenience. Multiply Shopify template is an absolute match if you want to launch a highly-productive e-store with both the first-rate functionality and stunning look. Designing your store’s home page, you’ll fall in love with the set of 15 sales-boosting sections that you can add in a jiffy. They let you add amazing banners, feature brand labels, showcase product collections and slideshows. That’s just all you need to get users interested and heading over to your catalogue to uncover what you’ve got to offer. SwitHut template has secured its place among the most well-rounded clothing store Shopify themes, and for good reason. It brings you a number of unconventional ways to present your products (scrapbooks and lookbooks, Deal of the Day, etc.) and ensures that shopping with you is convenient on every screen and in every modern browser. Moreover, thanks to multi-currency support, you can reach out to a wider audience at no cost to shopping experience. HugeSale’s minimal design is effective as it streamlines site guest to your product catalog and gives them no chance to get lost on the way. Product carousels, custom badges for special offers and a fully-fledged Category menu on the homepage are the pre-built means that get potential shoppers hooked. 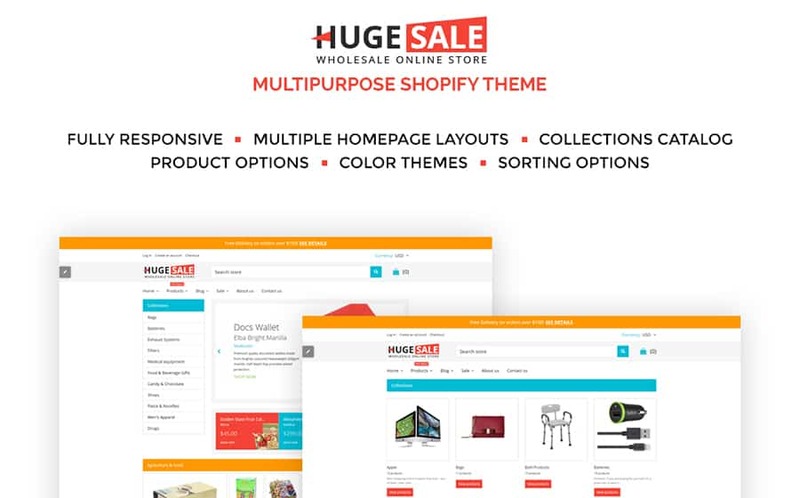 At the same time, it’s easy to install and fine-tune the HugeSale template in a user-friendly interface with multiple settings at hand. For example, you’ll enjoy the time-saving Color Switcher. It’ll let you swipe for a different color palette in just one click. Need a perfect template for launching an online car parts store? 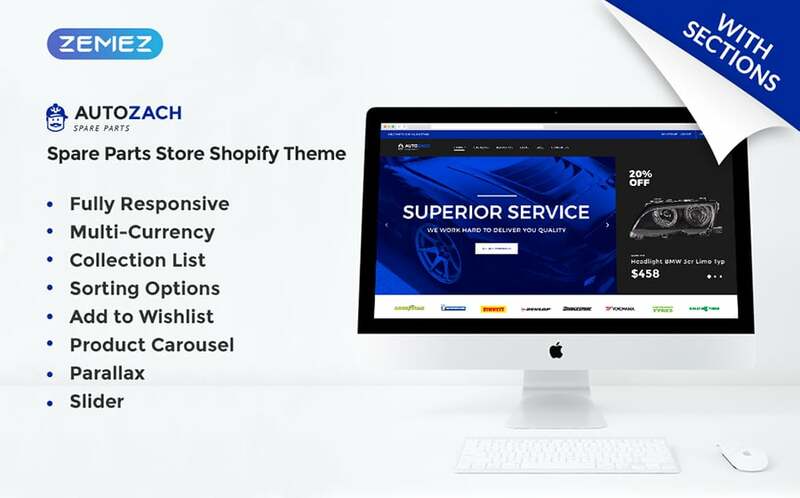 Then pay your attention to this spare parts e-store theme that features different payment, taxation and delivery methods and lets you power a multi-currency store that reaches out to global audience. Your website will be user-friendly even for those, who want to shop for a spare part on the go using their mobile device. This template is fully responsive and adapts to different screen resolutions on the fly. Moreover, Best Spare Parts theme incorporates all the necessary trust signals, such as contact details, Google maps, customer reviews and ratings, About Us section, etc. YodaGym is a powerful template with well-built skins for a sports equipment store, medial store or beauty care store. Each of its skins can be easily restyled by switching among 5 preset color schemes, finding your perfect Header variation among 9 variations and smashing it with exclusive Shopify Starter extensions bundle. The theme’s responsiveness is flawless with every template’s element ability to adapt to the peculiarities of small (mobile), medium (tablet) and large (PC) screens. Moreover, all the template images are Retina-ready, ensuring a stunning appearance on Retina devices. 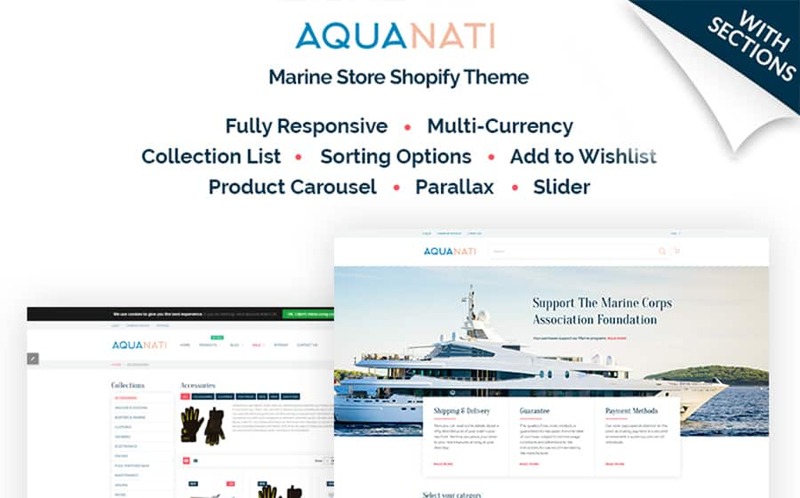 Aquanati is a niche-specific template with pure, uncluttered design for selling marine-related items. The template is 100% responsive, cross-browser compatible, feature-rich, SEO- and conversion-optimized. Thanks to pre-built Shopify Visual Builder, you can get as many different layouts as you want. Just add sections based on rich collection of 15 pre-sets, reorder or remove them. The template’s styling is easily configurable and automatically applied to the new sections/pages you add. 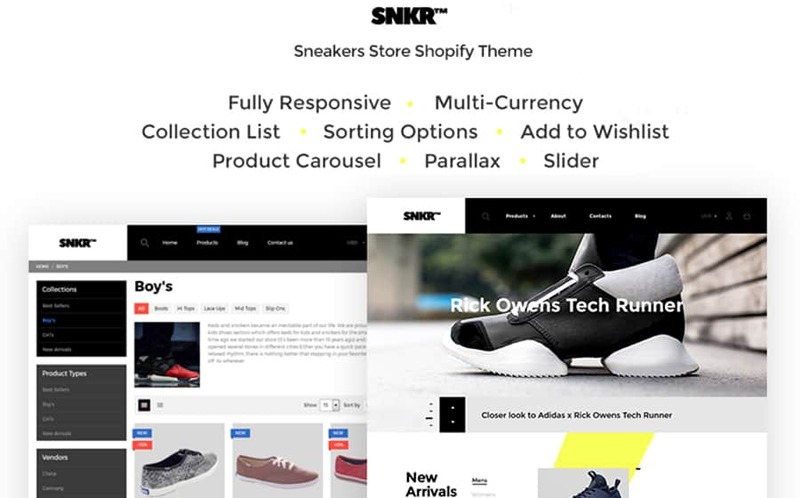 SNKR template lets you build a footwear store with a definite sense of style. Its UI is enhanced with sleek Parallax that puts a spotlight on your chosen items. To take your e-store to the top, this template equips you with some of the best extensions for Shopify. Of course, thanks to them, it’s next to effortless to power a wishlist functionality, collections, products carousels and other UI elements. Needless to say, SNKR theme is SEO-friendly and built in compliance with latest requirements of modern search engines, such as Google, Bing and Yahoo. 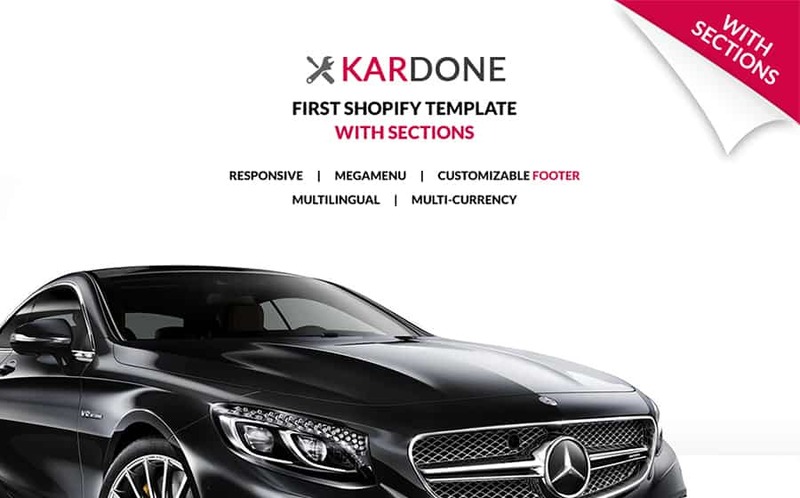 If you have a daring ambition to become one of the top clothes shops, this clean, elegant and feature-rich template will help your ambitions turn into reality. Additionally, the theme has all the functionality, necessary for running a successful online store and offers multiple payment, shipment and currency options. The theme also uses MegaMenu, which displays smart navigation panels with elements of different types that you add there. Your site guests will be able to navigate not only to your site pages, but also to categories and to single posts. It’s a big advantage in terms of boosting the UX on your website. 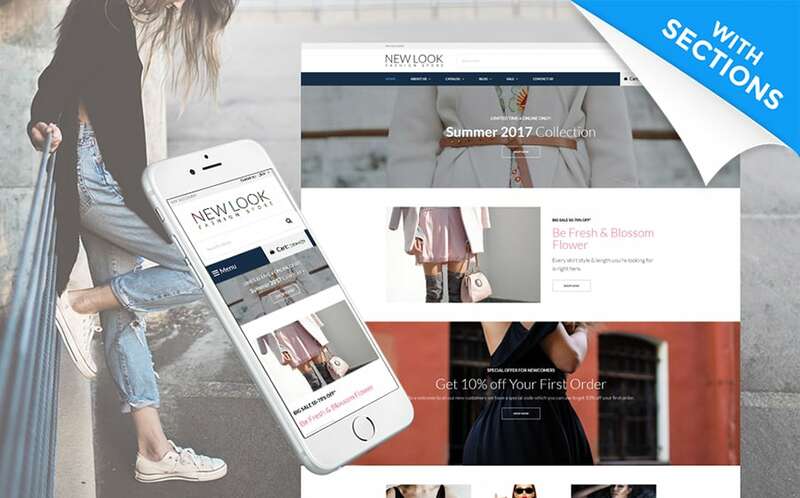 This responsive and cross-browser compatible fashion store theme has everything to become your real sales booster. In fact, Shopy has some of the most progressive functionality to offer. For example, it literally lets you sell your products through Instagram Feed with the help of a custom Instagram Shop extension. On top of this, you also get Rich Google Snippets, which make your website more prominent in Google search results. This responsive Shopify theme is built with Bootstrap framework using Shopify Sections. Clean and upbeat, it opens with a full-width slider that is followed by creative banner grid showcasing your best offers. Below come the sections showcasing your store’s most popular items and categories. 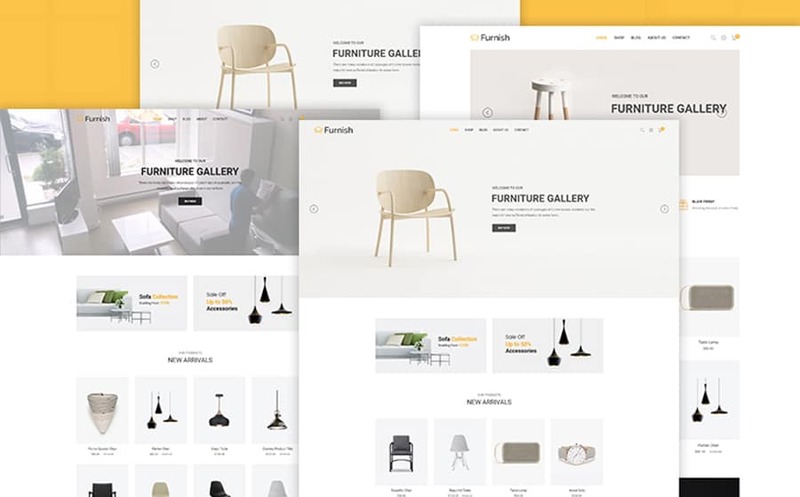 To boost customer loyalty, Furnish theme rocks a pre-built newsletter pop-up of brilliant design. Fast, reliable and fully adjustable, the exclusive AutoZach theme helps you create a website that will never let you down. Also the template offers endless personalization opportunities thanks to 15+ homepage sections, Shopify Visual Builder and diverse widgets at hand. Moreover, AutoZach supports multiple currencies and delivery methods that accommodate for the needs of every client. 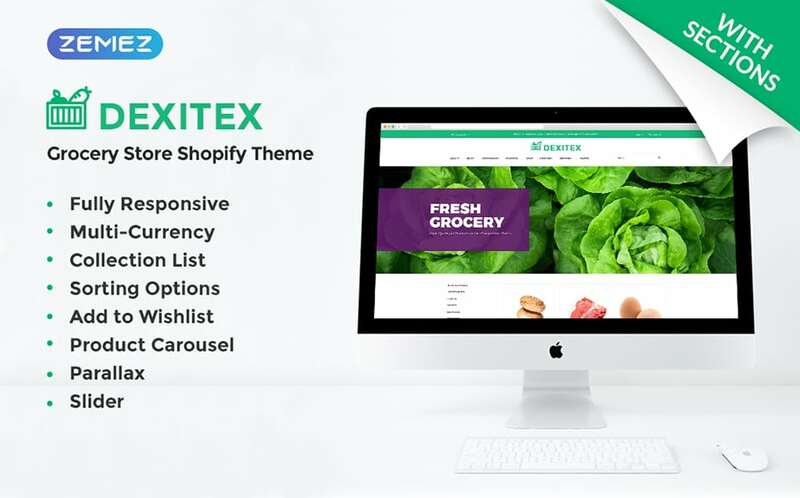 With Dexitex, online grocery shopping becomes really convenient thanks to the premium, feature-rich interface that this template delivers. In addition, there are custom extensions included to the template. So you can create product sliders, carousels, collections and social blocks that let you build a stronger online presence. On top of this, this e-store template has all the functionality that makes shopping simple and pleasant, e.g. Quick View option, Wishlist and Compare modes, etc. Staying on the verge of website design trends, Mi Drone theme has a high-contrast, ultra-clean UI that gives your website an exclusive premium feel. The ease of template customization is ensured by Shopify Visual Builder and 15+ UI blocks for your store’s homepage. 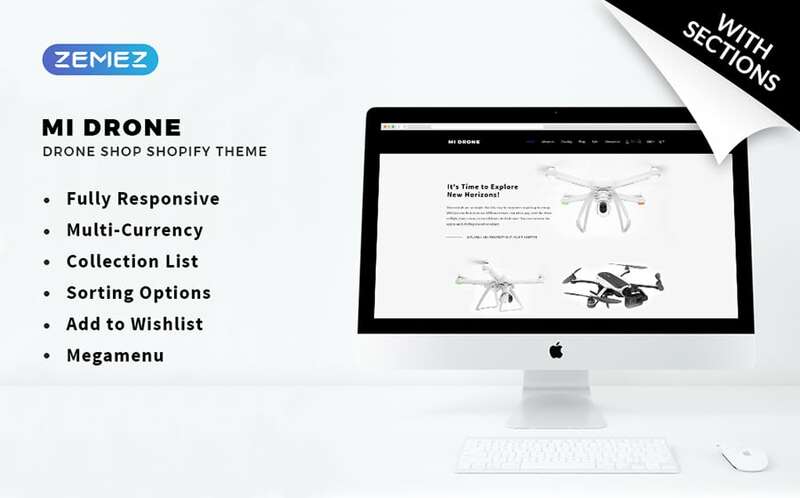 Not to mention, MiDrone theme is crafted using clean and valid code that makes your website invulnerable to the attacks of malicious users and ensures seamless, streamlined performance of all the website functionality. 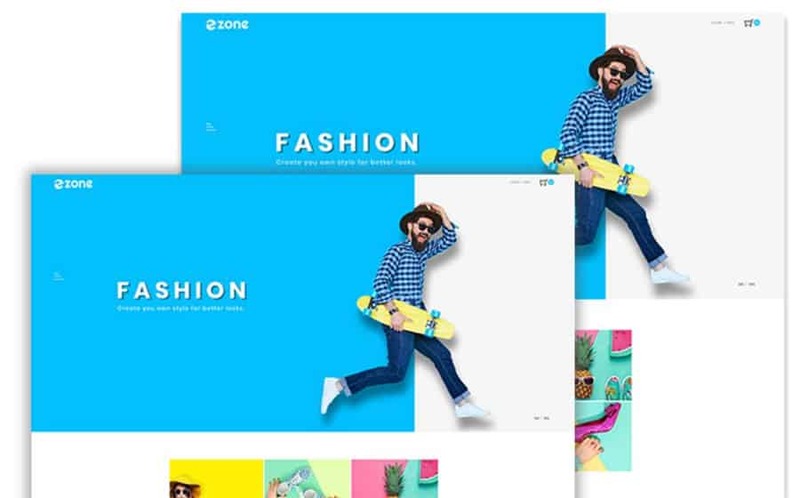 Mouthwatering images and rhythmic color splashes of this template turn your e-store into a clean and striking online store for tasty bites. The template achieves higher user engagement and conversion rate thanks to trendy grid layouts that permeate the store’s home page. Above all, thanks to flawless cross-browser compatibility and responsiveness, your website will be available for any client, no matter of the browser and device they use. Congrats! Now you’re familiar with some of the most advanced Shopify store designs for different niches. The functionality they incorporate is really stunning, isn’t it? At the same time, these Shopify templates are incredibly fast-performing and simple to manage. Grab one of them, and reaching prominence online will be round the corner! Your questions and comments are warmly welcomed. Take care!